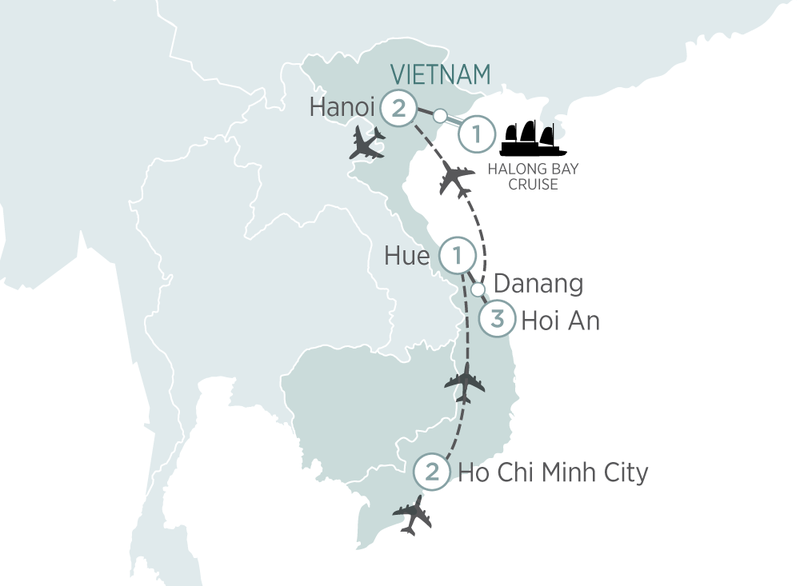 From Ho Chi Minh City to Hanoi, discover the best of Vietnam on this 10 day tour including a sailing through the World Heritage-listed Halong Bay. Xin Chao and welcome to Ho Chi Minh City! More commonly known as Saigon, this is a city with a turbulent and colourful past, although today it is the country’s commercial centre with over eight million inhabitants and four million motorbikes. You will be met by an Emerald Waterways representative and be transferred to your hotel (Please arrive before 11.00am). Be guided on a city tour of Saigon, visiting Reunification Palace, the Old Saigon Post Office, bustling Dong Khoi Street, Opera House and City Hall and the War Remnants Museum. This evening meet your Tour Director for a tour briefing. EmeraldPLUS: Travel to the infamous Cu Chi Tunnels. An ingenious network of over 200km of underground tunnels, they were built by the Viet Cong guerrillas as a means of protection, communication and deception. Join a Vietnamese Veteran and learn of the wars, strategies, atrocities and the resourcefulness of the Vietnamese which eventually led to the defeat of their enemies. Hear fascinating stories from first-hand experience to allow a real insight into one of the most famous wars of our time. Return to Saigon and spend the afternoon exploring the city. Transfer to the airport for your flight to the fomer Vietnamese imperial capital, Hue. Spend the afternoon soaking in this historic city. EmeraldPLUS: Live like an Emperor and dress up in royal costume for an Imperial banquet. Visit the Imperial Citadel, a historic structure that was the seat of the former Nguyen Dynasty. EmeraldPLUS: Experience a traditional cyclo ride through the Dai Noi or ‘Old City’, then take a tranquil ride down the Perfume River to the Tien Mu Pagoda. In the afternoon, travel over the scenic Hai Van pass to Hoi An. Take a walking tour and see old merchants houses, the Japanese Covered Bridge and Assembly Hall of the Chinese Congregation. EmeraldPLUS: Visit Reaching Out, an organisation that assists people with a disability to learn skills and gain meaningful employment. Experience one of the traditional Vietnamese arts during your lantern making class, guided by Reaching Out’s artisans. Silk lanterns line the streets and are a fixture in the local homes and shops of Hoi An. Afterwards, enjoy tea in the organisation’s peaceful tea house nearby. The afternoon is free for you to discover this wonderful town. Today is free to explore Hoi An and it’s surrounds. Transfer to Danang airport for your flight to Hanoi. EmeraldPLUS: Stop for lunch at KOTO restaurant, a unique restaurant that trains disadvantaged street children. This afternoon visit historic Ho Chi Minh Mausoleum (view from outside) and see Ho Chi Minh’s former home, then the iconic One Pillar Pagoda. Continue to the Temple of Literature, Vietnam’s first university. Opportunity to view this spectacular landscape from the air with a 45 minute seaplane flight from Hanoi over Halong Bay (additional cost, must be pre booked). Travel to Halong Bay and join your luxurious traditional style junk. Halong Bay is a UNESCO World Heritage site known for its stunning scenery. Thousands of karst limestone pillars rise dramatically out of the emerald water creating a surreal but incredibly beautiful seascape. Settle in for an unforgettable overnight cruise through the bays and islets of this magnificent region. After a sumptuous lunch, discover the mysterious Tien Ong Cave which is not only a beauty spot but also an archaeological site with stunning stalactites and stalagmites. In the evening enjoy the breath-taking surroundings as you relax on board. After breakfast, take your time to visit the Cua Van floating village either by kayak or traditional rowing boat. Sail back to the mainland leaving the majestic scenery behind. Transfer to Hanoi and take a walking tour through Hanoi’s historic Old Quarter. EmeraldPLUS: Attend a traditional Water Puppet performance then go backstage to meet the puppeteers. Finish with a farewell dinner at a local restaurant. Transfer to Hanoi airport for your onward flight. From Siem Reap to Ho Chi Minh City, discover the best of Vietnam & Cambodia with highlights including Phnom Penh, Angkor Ban, Angkor Wat & Cu Chi Tunnels.